I am going to present in this blog, the “secret sauce” for organizational transformation but first some context. 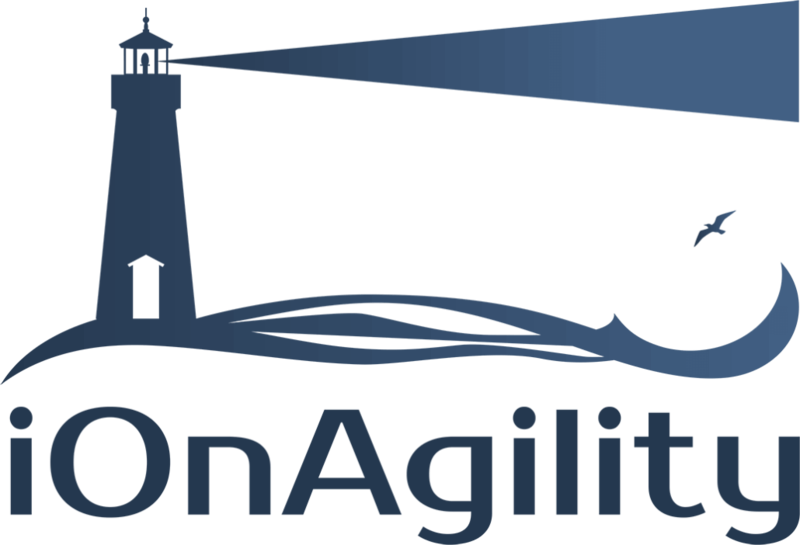 I have been an advocate, coach, consultant and trainer of Business Agility for over 15 years. The biggest challenge I have experienced in all these years is the idea that “Agile” is something you can, or should, implement. Yes, there are Agile frameworks, practices, techniques, and tools that can help us achieve goals in ways that might be better suited, or different, than other methodologies, practices, techniques, and tools that we may have used in the past to achieve goals. Now the “secret sauce,” collaboration! Yes, collaboration is the secret sauce. More specifically, building collaborative organizations is the secret to successful organizations. My mentor and guide in the world of collaboration is Jim Tamm. Jim and his colleague, Ron Luyet, wrote a groundbreaking book called, Radical Collaboration: Five Essential Skills to Overcome Defensiveness and Build Successful Relationships. Radical Collaboration has its roots in the State of California, where Jim Tamm was a Senior Administrative Law Judge overseeing dispute resolution in collective bargaining among public employees. In the late 1980s, the staff at the State noticed that they kept seeing the same parties end up in litigation each time they had a dispute. Other parties, operating under the same statutes, were able to resolve disputes more effectively. They rarely ended up in litigation. The State conducted a massive statewide survey to determine the differences between their effective and ineffective constituents. They discovered that those constituents needing greater assistance in resolving disputes lacked skills in conflict resolution and relationship building. Jim told me that these disputes rarely had anything to do about the law; rather the constituents could not collaborate effectively. Success in today’s marketplace requires an integrated approach to business and employee development. You must pay attention to the inside and the outside of your business. Outstanding performance is the result of an elegant balance and interaction between all four but we as organizations we tend to give more focus to the outer side. 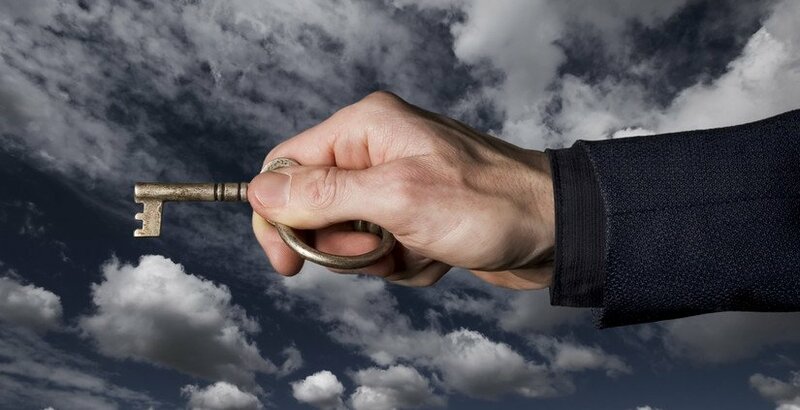 Traditional business analysis has focused on the outer side of business primarily on questions of “what should we be doing?” and “how can we do it better, faster, and more efficiently?” It turns out that the inner side of the business is where the most significant opportunity for radical improvement resides. You must pay attention to relationships, not just strategies. The inner side of the business contains the heart and soul of the business. 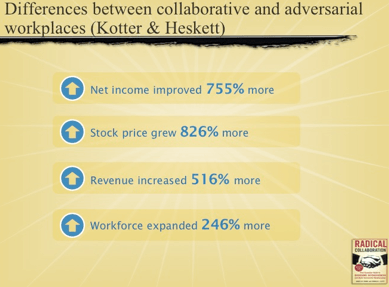 In their classic book, Corporate Culture and Performance, John Kotter and James Heskett reported on the role that corporate culture and collaboration plays on the success or failure of major corporations. In a well-documented study with more than two hundred blue chip enterprises in twenty-two industries over eleven years, when corporations focused on moving from adversarial cultures to collaborative cultures, the improvements of performance benchmarks were amazing. Individuals commit to truthfulness and to a climate of openness that allows people in the relationship to feel safe enough to discuss concerns, solve problems, and deal directly with difficult issues. Individuals take responsibility for the circumstances of their lives including the intended and unintended or unforeseen consequences of their actions. They seek solutions not blame. Individuals commit to knowing themselves deeply and are willing to explore difficult interpersonal issues. They take responsibility for their own self-awareness. They seek to understand the concerns, intentions, and motivations of others. Individuals utilize problem-solving methods that promote a cooperative atmosphere and practices in support of each other. They avoid practices that foster subtle or unconscious internal competition. My focus is to help organizations become a better place to work; I feel that creating collaborative cultures will help us in that journey. 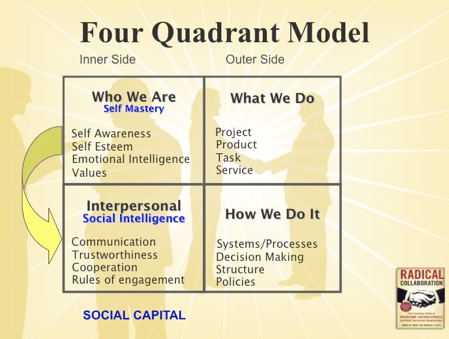 Watch for upcoming blog posts where we will explore each of these five skills in more detail. You can also contact us for more detail about bringing these skills to your organization. The other day, I heard someone say, “He comes to the relationship with a lot of emotional baggage.” Truer words were never spoken; some people come with handbags and others come with steamer trunks, but all of us bring our past experiences to any new endeavor. The same lesson holds true when taking on an agile adoption or transformation effort in your organization. All organizations and the people in them have baggage. To succeed in an organizational change effort, we have to accommodate that baggage with a packing strategy. Airlines restrict you to a certain number of carry-on and checked items, each of which must not exceed certain weights or dimensions. So the smart traveler adapts his packing strategy and which items he chooses to bring based on these constraints. Similarly, as an organization goes through change, its members have assumptions and existing rules and standards that need to be identified and considered. One way to do this is through a game that I like to play with product owners and managers called The Marshmallow Challenge. Traditionally, the game is played to understand the importance of the iterative process but I feel the most important part of the game is the realization players leave with: All projects have marshmallows. When used to demonstrate a typical sprint, the marshmallows are a metaphor for assumptions in the product backlog. When used to talk about agile adoption and transformation effort, the marshmallows become assumptions of a different sort. They become the guesses you make about how this new way of thinking about how you build and deliver products will integrate into your existing culture, processes, financial models, hiring practices, leadership styles, technology ecosystems, reward systems, customer interactions, etc. By identifying these “marshmallows,” you can build what I like to call an opportunity backlog and put together a team that can influence change. From a change management perspective, the effort to transform an organization so that it can leverage and benefit from lean thinking and the values and principles of agility is not very different than any other organizational change effort. Yet many teams and organizations fail because they do not approach it that way. Instead, they see it as a change that will only affect software teams or the IT department. Nothing could be further from the truth. Do the employees know, understand and support the vision? 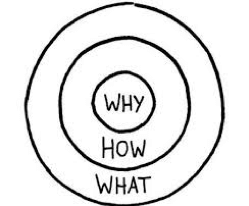 One of my favorite quotes is from John Kotter’s Leading Change, “Whenever you cannot describe the vision driving a change initiative in five minutes or less and get a reaction that signifies both understanding and interest, you are in for trouble.” Your vision is probably not about adopting agile; there is probably a more specific reason for the change. Spend the time to truly understand the real reason for the change and focus on that. Lean thinking and agile methods may be a part of that change but they will not be the only items in your opportunity backlog; nor will they likely be the most important. Remember that the most important part of an organizational change is about people changing at all levels of the organization; as such, it is highly complex. Some people resist change while others embrace it. Make sure you have the right people working with you and a toolkit of organizational change practices to explore and embrace. When choosing a coach or guide for your team, make sure you are working with people that have experience beyond just helping teams embrace Agile. The best coaches understand the bigger picture of change and have experience with the majority of the techniques listed above and with various organizational change models. There are many change models available; all of them have their strengths and weaknesses. Just like agile methods, no one organizational change method alone is sufficient. Just like packing your luggage, when you’re ready to become more agile, think about your needs (vision) and constraints (the current organizational reality that may have to change) and come up with a strategy that will help you make it past check-in!